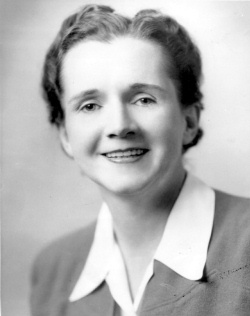 Rachel Louise Carson received her degrees in marine biology from the Pennsylvania College for Women and in zoology from the Johns Hopkins University. Her true calling turned out to be much broader in range than the academic study of wildlife, however. As Carson's career as a scientific writer progressed, she became interested in the effects of artificial chemicals on the natural environment. Through her published research, she was the first to direct public attention to the environmental damage caused by the indiscriminate use of pesticides in agriculture. She is thus regarded as the public figure who launched the environmentalist movement. Upon enrolling in college, Carson had initially intended to major in English and become a journalist or novelist. Her attentiveness to presentation allowed her to convey even rather dry facts in an evocative prose style that held the attention of the general reader. Wedded to her extensive academic training in biology, Carson's talent for expressive writing positioned her ideally to bring scientific findings about ecology to a mass audience. She published a famous trilogy about the delicate and complex ecology of the sea, beginning with Under the Sea-Wind. That first volume took a large-scale approach, describing the living systems of the ocean in everyday, easily understood terms. Under the Sea-Wind was only a moderate commercial success, but it, along with Carson's writings for the United States Fish and Wildlife Service, set the stage for her second volume, published ten years after the first. The Sea Around Us made Rachel Carson a household name. It became not only a bestseller but also a National Book Award winner. In it, Carson examined more explicitly than before the effects of human action on the creatures of the ocean. The last book in the trilogy was The Edge of the Sea, in which Carson trained her writerly and scientific gaze on the shoreline of the East Coast to examine the endangered organisms that populated it. >These books established Carson as a public figure who advocated respect for the environment, but the work that would be her most lasting legacy was yet to come. She began to examine data on the effects of agricultural pesticides, spurred in part by a letter from two friends who owned a farm in Massachusetts and expressed concern that sprayed pesticides were causing harm to local wildlife. Carson's research convinced her that high exposure to pesticides such as DDT threatened not only beneficial insects and birds but also people. She put her conclusions in a landmark fourth scientific volume, Silent Spring. In the famous image that gave the book its title, Carson hypothesized about an ecosystem in which the calling of birds had been silenced by poison in soil and groundwater. Carson alleged that the regulations governing use of these chemicals were inadequate, though her positions were not as extreme as they are sometimes now characterized. She did not support the outright banning of pesticides. Rather, she objected to "indiscriminate" use, which is to say, use without any thought for caution and moderation. Eventually, Carson's views were taken seriously at the highest levels of government. President John F. Kennedy's Science Advisory Committee solicited her advice on how to improve rules about pesticide use. She also testified before Congress. Through her influence, she assisted in bringing about far stricter controls on toxic chemicals such as DDT, which deteriorates slowly and thus remains in soil and groundwater for very long periods of time. Although Carson's fame meant that she was in demand as a public speaker, she much preferred the solitude of research and writing. She employed assistants but frequently did even tedious archival research herself to avoid wasting time reviewing material with which she was already familiar. The same concern with clarity and elimination of waste characterized her writing itself. Though Carson died in 1964, two years after the publication of Silent Spring, that book is still frequently cited in environmental policy recommendations by analysts and regulators. Her best-selling work, it also remains a staple of high school and college science classes. Indeed, more than one major publication has deemed Carson one of the most influential figures of the twentieth century. 1. The word launched in the passage is closest in meaning to _________ . The author uses the word dry in the passage to indicate that the facts discussed are _________ . Which of the sentences below best expresses the essential information in the boldfaced sentence in the passage? Incorrect answer choices change the meaning in important ways or leave out essential information. Carson felt it necessary to choose between becoming a scientist and becoming a popular writer. People were surprised at the large-scale damage Carson's writings brought to their attention. Carson initially found it difficult to write about ecology for a mass audience. Carson was able to popularize her views by combining her writing talent and knowledge of biology. Which of the following is NOT mentioned in the passage as evidence of Carson's influence on the regulation of pesticides? She served on a presidential committee. Her work is still cited by regulators. She wrote the first set of pesticide regulations. Directions: An introductory sentence for a brief summary of the passage is provided below. Complete the summary by selecting the THREE answer choices that express the most important ideas in the passage. Some sentences do not belong in the summary because they express ideas that are not presented in the passage or are minor ideas in the passage. This question is worth 2 points. Rachel Carson was a pioneering environmentalist who helped draw public attention to the effects of human activity on wildlife. Carson at first considered majoring in English and becoming a nonscientific writer. The government considered Carson a valued expert and invited her input on ecological policy. The book Silent Spring has had both immediate and long-term influence on environmentalism. Carson's three books about ocean ecology increasingly focused on the dangers humans posed to marine life. Many scientists doubted Carson's conclusions, causing her to write more books to support them. Carson did much of her research by talking to people with everyday experience using pesticides.